pestIQ is an intelligent online tool that makes it faster and easier for advisers and farmers to manage insect pests in broad-acre crops and pastures. Try it free, and find out for yourself. Identify insects quickly and accurately with pestIQ's simple visual interface. Access extensive insect profiles with monitoring techniques, economic thresholds, chemical, biological and cultural control options, life cycles, image galleries and more. 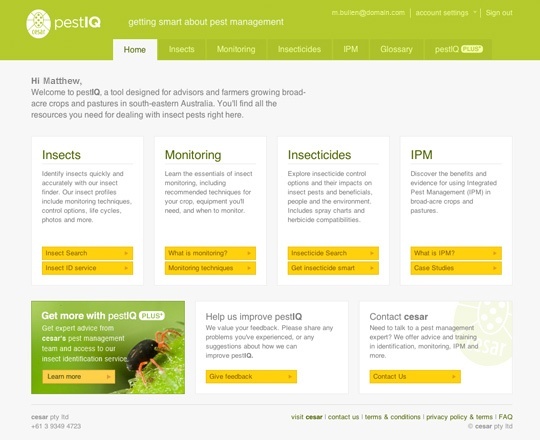 Use pestIQ's smart insecticide search engine to find the right insecticide for any insect and crop combination. Each insecticide profile includes simple spray charts with application rates by crop & pest, and impact ratings for beneficial insects. Learn the essentials of insect monitoring with recommended techniques by crop, insect type and the time of year. Includes step by step instructions, equipment you'll need, and the pros and cons of each monitoring technique. Learn more about Integrated Pest Management (IPM) in broad-acre crops and pastures. Discover the benefits and evidence for IPM, and read our detailed case studies. With pestIQ PLUS+ you get the additional support of cesar's team of experts for 12 months. We provide professional advice over the phone and email, and insect identifications when you need to be certain. Our highly skilled and knowledgeable team are just a call away. We can provide advice on a wide range of pest management issues and challenges including insect monitoring, identification and insecticide use. Got a simple question, or don't have time to chat. You can email us for advice or information on any insect related issue. With pestIQ PLUS+ you get 3 Insect IDs per year - valued at $180. We provide a fully authenticated report with control options within 48 business hours of receiving insect samples. 12 month subscriptions available only. Subscription prices vary depending on the number of users as detailed below. All prices are inclusive of GST. Single user or multiple (2 or more people) user subscriptions are available for pestIQ and pestIQ PLUS+. For multiple user subscriptions any combination and quantity of pestIQ and pestIQ PLUS+ users may be selected.